Discussion in 'Lexus Lounge' started by krew, Feb 15, 2016. Lexus will reveal the hybrid version the LC coupe at the 2016 Geneva Motor Show next month. Den, Trexus and mikeavelli like this. Glad to see that Lexus officially confirmed the obvious as far as a Geneva reveal for the LC 500h. A couple of comments on the last paragraph of your story, Kevin: the Lexus concept to be exhibited alongside the LC 500h at Geneva is the LF-FC fuel cell sedan predictor for the next LS, and NOT the LF-LC concept that predicted the LC, as you wrote. I don't blame you: the similar LF-FC and LF-LC names easily lend themselves to confusion. Also, it might be helpful to clarify that the 11:30 CET (5:30 ET/2:30 PT) times are A.M.
CIF, mikeavelli and krew like this. So this is just the concept model still? Same general look as it was in Japan but not details on the fuel cell? What you're seeing in the picture above is the production LC 500h with a hybrid gasoline engine + electric motor(s) powertrain. This does NOT have a fuel cell. My reference to a fuel cell was about the LF-FC concept sedan that will make its European debut at the Geneva Motor Show alongside the LC 500h that you see above. mikeavelli and krew like this. It might have been me hoping that Lexus would show the LF-LC and LC 500h together, just to illustrate how close they are to each other design-wise. Regardless, I've updated the post with the correct concept and clarified the debut time. Ian Schmidt, Joaquin Ruhi and mikeavelli like this. First off, love the pictures! Looks great in blue! To be faster, it will need AWD. The hybrid motors and battery will add hundreds of pounds of weight. Even if they went to a V6 gas engine, which is probably what they should do, that would only maybe cancel out the weight gain. The only way to be faster is to add traction or at least 100 HP. Considering the competition from the Audi A8 diesel and V6 S400 Hybrid, expect the former. Note these options aren't sub-5-seconds fast, like the LC is. The problem with the current LS600hL is weight. They need to fit a lightweight AWD system, and probably drop two cylinders. How they solve these issues and make the hybrid outperform the standard model should be very interesting. Not that obvious. They could have sent it to New York instead. I was asked by Lexus at an event last year what is one move they should make and I told them (had some wine lol) I was stunned how BMW beat them to the hybrid cool car game with the i8. Lexus had the head start and let BMW (and others) get the limelight. So I'm super happy this flagship hybrid coupe is a reality. Trexus, oem_is300, Ian Schmidt and 1 other person like this. 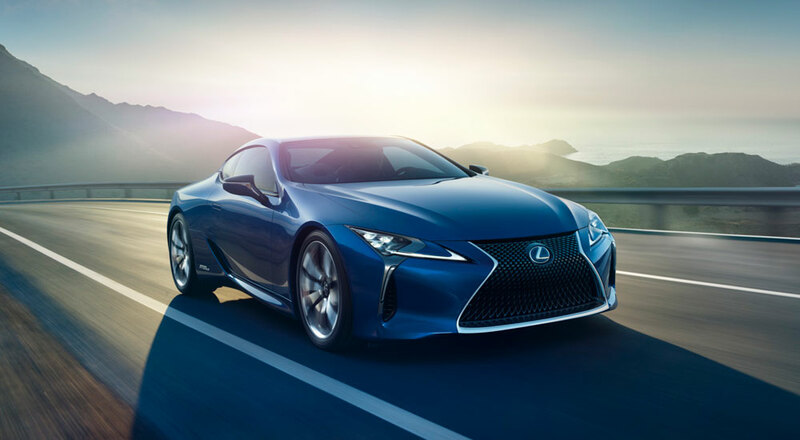 "Although Lexus doesn’t say exactly what powers the LC 500h, a report coming from Motoring indicates it will combine a 3.5-liter V6 with an electric motor. The former will be good enough for 308 horsepower (230 kilowatts) while the latter will develop 217 hp (162 kW) which will grant the performance hybrid with a combined output of 470 hp (350 kW)." This blue color is very nice, seems a shade lighter than the concept car blue. Still, I like the red color better. NVlaar and Joaquin Ruhi like this. That was actually my initial reaction! And, like you, I thought it would be awesome to show the concept and production versions side-by-side. Anyone have any idea how faster the hybrid would be if it got 470 total horsepower that is predicted? Great color choice! The blue looks a tiny bit lighter than USB, more like a sky blue, cool! The LCH I believe and hope will change people's minds on hybrids. This car is going to be sick! About time. Mikeavelli makes a GREAT point that BMW beat Lexus to the punch in terms of having a "cool luxury hybrid". The GS and LS hybrids didn't really qualify as super-desirable cool luxury hybrids. So it's about time that we (finally) see the LC hybrid, and also the next-generation Lexus hybrid system. I really hope it's worth the wait. Anyone have any idea how faster the hybrid would be if it got 470 total horsepower that is predicted? The LC 500 (5-liter non-hybrid V8) versus LC 500h (probably 3.5-liter V6 hybrid) comparison is somewhat similar to the 3rd-gen GS 460 (4.6-liter non-hybrid V8) versus GS 450h (3.5-liter V6 hybrid). In that case, the GS V8 had 3 more horsepower than the V6 hybrid but was nonetheless 0.2 seconds slower 0-60 than the hybrid. I'd expect similarly close results for the 2 versions of the LC, but the wild card here is how the LC 500h's new "Multi Stage Hybrid System" compares with and improves upon the current GS 450h. Totally agree, Lexus has always been ahead of the game with their hybrid models, and then BMW came out with the i8 and beat them to the fun hybrid car. I think this will be a huge step to getting Lexus back up there. Really looking forward to hearing this next-gen hybrid system they have in it. For the last gen GS, it was because Lexus way over-estimated the take rate of hybrid luxury cars. They detuned the output of GS460 to give GS450h a better marketing position, but that move really killed GS460 in reality. Lexus should learn a lot from it. I would say that the hybrid or V8 buyers are two very different groups. Today's gas price, making it even more difficult for the hybrid to succeed in the market. However, Toyota/Lexus should hold on the hybrid tech for the long term.